Sorry it is taking me so long to wrap this solar-flare stuff up, but I have one more consideration. I have written about this years ago, but not mentioned it much lately. If you are interested in learning about and tuning into solar flares, there is something else you might like to know. I call it the cosmic breathing, but if that is too direct just call it cosmic flux. There are two main types of cosmic radiation that reach us. The first obviously is radiation from the sun and that follows (roughly) an eleven year cycle. When the solar cycle is at its strongest (like now), we have a sharp increase in solar flares. This increase during the solar maximum acts like a great shield that wards off another kind of radiation that is not coming from the sun, but rather coming from deep space, places like the center of the galaxy and elsewhere: cosmic rays. Cosmic rays are super high-energy particles that come from outside our solar system, and their secondary particles directly penetrate and impact the Earth's atmosphere, occasionally reaching the surface of the earth. Cosmic rays are anti-correlated with the eleven year solar cycle, which simply means that when the sunspot solar cycle is at its peak (like now), the cosmic ray particle penetration is at a minimum. And the reverse is also true. When the sunspot cycle is at its minimum (weakest), cosmic ray penetration of Earth's atmosphere is at its strongest. In other words, we are alternately pummeled by extremes of solar radiation on one hand, and cosmic ray influx on the other. I hope that is clear. It is also important to understand that Earth's magnetosphere protects Earth from both kinds of radiation, solar and cosmic. 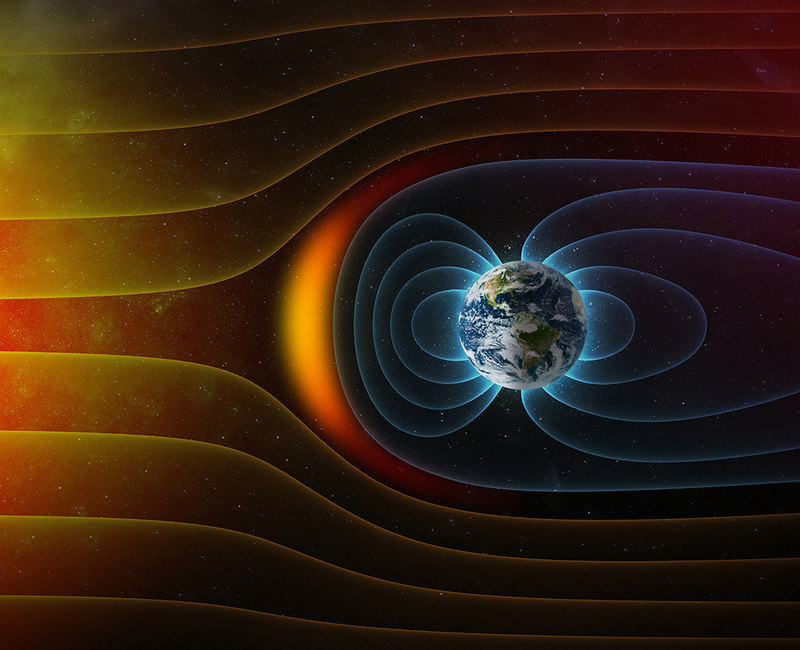 In the image shown here, you can see how the magnetosphere, like the bow of a ship, envelopes and protects Earth from ready access by solar ejections and cosmic rays, the two influxes. Of course I tend to think of both of these influxes as coded information for change. They are like different kinds of cosmic vitamins, and we get dosed with one and then with the other, alternatively. In this way the cosmos is both our doctor and life keeper. Because we have them (and are still alive), it is obvious that we need both kinds of vitamins to exist and it has been pointed out that large-scale systems like the galaxy (and even our solar system) require a constant flow of information to continue to cohere (hold together) and to not collapse. The science of such information is called cybernetics, the study of regulatory systems that allows us to remain the same while undergoing change. In other words, cybernetics is the process of how something becomes different and yet remains the same. Our physical body requires cybernetics to remain regular and not morph into something weird. Nothing is more regular than solar radiation, except when it is not. Then we have discussions like we are having now with solar flares, conversations centered on sudden solar change and how to take it gracefully. All I am doing here is pointing out the existence of this great cosmic breathing, an eleven-year cycle such that every five and a half years we are breathing in either solar change or cosmic change. Because they exist, we must need and be used to both. We could also say that one is local (solar and about our self), while one is much more distant (the cosmic rays). This current solar maximum is more disruptive and obvious to the self, but that does not mean that the cosmic rays are not just as seminal, but perhaps not as direct in effect . Again: different kinds of vitamins. As you can see, all of this can be endlessly complex, but also very simple. I can't speak as to what destiny holds, but I do know that certain parts of us will not be denied. We can call them talents. When everything else falls away, the last to go would be those talents or urges that just keep on coming. They are the strongest, and our talents are where each of us is a die hard. It is to our advantage to learn what our particular talents are and attempt to position them so that they can be realized in this life. The traditional recipe for success has always been not to hide our talent under a bushel, but to find a way to put our talent between us and a need that society has and let nature take its course. But to do this, many of us have to figure out what our talents are. You'd think we would know, but often we can't distinguish between what are talents and what are just hopes and dreams, i.e. what we wish were talents. Times of extreme solar change or personal catastrophes can be helpful. When the self is shattered or vacated and is forced to reform, many of our so-called pipe dreams are lost along the way. If we are patient and watch our appetites return (as the self patches itself together), our actual talents usually are the first to reappear, so take an inventory. What do you really want to do with your life? Let your talents be your guide.